The usual picture the media paint of Africa is one of corruption, violence and hunger, a picture that plays well into the goal of aid groups to bump up revenue. After all, if there’s no crisis, there’s no money. And as humanitarian groups become fixers and access providers more and more frequently for cash-strapped foreign correspondents, who are under increasing pressure to feed the instant gratification demanded by the internet beast, that gloomy perspective creeps insidiously into what gets written. On the other hand, some African cheerleaders criticize foreign writing about the continent for missing the success stories of local democracy and sustainable economic development that don’t fit into the colonial framework. As Karen Rothmyer notes in her excellent Columbia Journalism Review article, “Hiding the Real Africa: Why NGOs prefer bad news,” what’s often lacking is a more contextual and nuanced reporting that sees Africa as a complex place, with successes and failures, and not just the site of the next story on famine. I tried to keep this in mind as I headed to Malawi in late February to cover the issue of food security. A few years ago, this landlocked nation was a poster child for hunger. After the disastrous 2005 corn harvest, which left five million of the country’s 13 million people hungry, newly-elected President Bingu wa Mutharika launched a massive program to provide government-subsidized fertilizer and seed to the nation’s farmers. It was a rebuff to western governments which had for years been preaching that only free markets and government deregulation would solve chronic problems of hunger. Yet in a country where land is farmed intensively and the soil is widely depleted, Mutharika’s gamble on subsidies paid off handsomely: by 2007 Malawi had a surplus of corn and was selling grain to the World Food Program and exporting it to nearby Zimbabwe. Child hunger was down markedly. 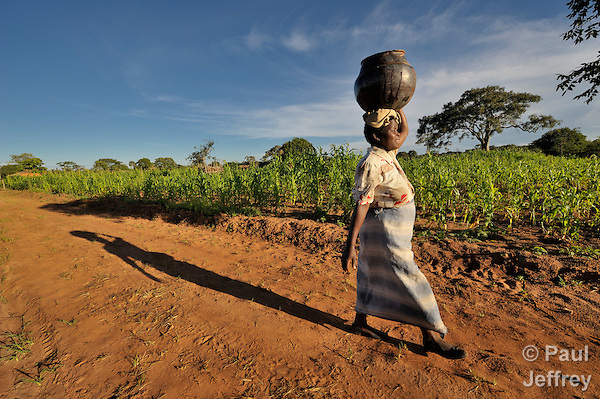 Some donor countries reluctantly supported the program, though the U.S. government largely continued to grumble about inappropriate Malawian government interference in the marketplace–although the U.S. government provides heavy subsidies for U.S. farmers. Any person who vitiates the atmosphere in any place so as to make it noxious to the public to the health of persons in general dwelling or carrying on business in the neighbourhood or passing along a public way, shall be guilty of a misdemeanour. Mutharika has also grown increasingly intolerant of the press. When Malawian media last year reported on the government’s own figures that, despite the subsidy program, more than a million people in the country didn’t have enough food, Mutharika struck back, threatening “to close down newspapers that lie and tarnish my government’s image.” And then he ordered government officials to change their projections of food insecurity. I went to Malawi to report on how some church-related agencies were working with several local communities that, despite the achievements of the government’s subsidy program, had not been able to grow enough food. The reasons for these local problems are several. For example, climate change has reduced rainfall or made it highly irregular. I interviewed farmers who had received and utilized the government-subsidized fertilizer and seed only to wait and watch as the rains didn’t arrive and the seeds sprouted and died. In other place, local corruption–the subsidy coupons are usually distributed by local chiefs–had caused inequality. In response to some of these challenges, the church agencies are working with communities installing local irrigation systems (mirroring the government’s advocacy of a huge irrigation program alongside the country’s major lake and river), pushing crop diversification (e.g., planting drought-tolerant crops like millet and sorghum instead of corn), and distributing small livestock, like goats, which over time will build the capital reserve of poor families allowing them to cope better with seasonal income fluctuations. It seems to me that any healthy discussion of Malawi’s achievements would take these shortcomings into account, but instead they’re swept under the rug. And so instead of the church agencies issuing a general appeal for funding the Malawi food security work, it was quietly funded by a European government. So it’s complicated. Writing about it involves reporting both the success of an African government in responding to a chronic problem as well as that same government’s intolerance of criticism of the program’s flaws. Gustavo Parajón died on March 13. He was a Nicaraguan medical doctor and Baptist pastor who founded an ecumenical relief and development group, CEPAD, in the wake of the 1972 Managua earthquake. From personal experience, I can attest that he was an infinitely patient man with young gringo missionaries struggling with cultural sensitivity and Nicaragua’s unique Spanish. His patience was also political: although a fierce critic of U.S. policy, he was a leading voice for reconciliation in the middle of the revolution and war. He and CEPAD were intermediaries between the young Sandinista revolutionaries and Nicaragua’s evangelical community–a relationship that often needed coaching and mediation. And although several of his colleagues and staff were killed by the Contras, Gustavo pushed incessantly for human rights to be respected in the middle of the war and helped hammer out local ceasefire agreements. His work to mediate the conflict between the Sandinistas and eastern Nicaragua’s Miskito population, and to establish and nurture peace commissions in the southeast of the country, was of historic importance. I traveled with him on several trips into the mountains where his respect for the poorest campesino produced treatment no different from how he related to Sandinista officials or Contra comandantes–they were all God’s children to Gustavo. When Central American countries created National Reconciliation Commissions under Oscar Arias’ peace plan, Gustavo was a widely accepted choice to integrate the Nicaraguan commission, which also included Vice President Sergio Ramirez and the Catholic archbishop of Managua, Cardinal Miguel Obando y Bravo. In the polarized politics of the time, useful idiots of the U.S. political right, like the Institute for Religion and Democracy, attacked him as an apologist for the Sandinistas, when in fact Gustavo represented the best of Nicaragua’s civil society. He was indeed one of the more authentic “lovers in a dangerous time”–a phrase that reminds me that I first met Bruce Cockburn in Gustavo’s office. Gustavo attracted friends from all backgrounds. Gustavo was 75 when he died suddenly of a heart attack. His memorial services were packed. In a massive gathering on March 15 in Managua’s Casa de los Pueblos, President Daniel Ortega awarded Gustavo the country’s Orden Cultural Rubén Darío. Gustavo’s widow, Joan, sat between President Ortega and First Lady Rosario Murillo, who called Gustavo “a hero of the culture of peace.” The music was from the Misa Campesina, though at the end everyone joined in singing Handel’s Hallelujah Chorus. Following President Ortega’s remarks at the service, Joan took the microphone and recited a poem by Rubén Darío that she said was among Gustavo’s favorites. It speaks to both Gustavo’s inspiration and his practice. de toda mentira, de toda ruindad. para sus verdugos, imploro perdón. March 20, 2011 | Filed under Africa, Blog, Food. I recently read the thin book “Like Breath and Water; Praying with Africa.” which is about the author’s visit to Malawi. I had an entirely different picture of the country than Rev. Jeffrey gives in his nuanced view. When I see the photographs and read his reports in “Response” I so often wish I were there, with the missionary/journalist. I am so appreciative of the perspective that Paul Jeffrey provides. This study predicts that climate change effects will be severe in Africa, and because of the continent’s low capacity for mitigation and adaptation, could lead to greater social conflict. You always help me to think and rethink what is happening around the world Thanks. And a special thanks for the homage paid to Gustavo Parajón and the poem by Rubén Darío. Unfortunately many, if not most of the poor regions of the world, have almost no capacity to mitigate and very limited ability to adapt to climate change. This is true for the indigenous peoples of Alaska that I have worked with for years, and is also true for the Philippines. Not long ago the Siberian Yupik “Eskimos” of Gambell on Saint Lawrence Island in the northern Bering Sea lost their mayor, his 11-year-old daughter and his 11-year-old nephew while pulling a bowhead whale home in their walrus-skinned boat. They had to hunt much further from shore because of melting marine ice, and traditional knowledge of weather patterns is not as accurate with changing climate, adding to the danger. The populations of bowhead and walrus will likely be victims of the melting sea ice, possibly within 50 years. Gambell is one of the oldest continuously occupied communities in all of North America because of access to these two species and other ice-dependent species. The Siberian Yupik culture that has this food at the core of their language, culture and economic well-being will likely cease to exist. But the circumstances for the future of Filipinos is much worse. The record imports of rice during last year’s drought is a predictor of what will be necessary to produce food during endemic droughts expected as a consequence of climate change…as the already overpopulated archipelago continues to grow at 2.5 million a year, equivalent to an additional Manila every five years, and as competition for limited global food production causes shortages and dramatic price hikes. President Aquino is stumping for a reproductive health bill to curb population growth, but it is being opposed by much of the Catholic Church. This week there were demonstrations in the Philippines against rising prices of fossil fuels…another harbinger of things to come, fuel shortages and price hikes, almost no domestic production, which could cause further food shortages as a consequence of decreases in domestic food production. Gloomy? Doomsday? That is not my intent. We are at the tail edge of being able to do something about these dynamics, but the upside is that these issues have pulled our planetary society together in recent years to act collectively…somewhat, and not enough. We need to do more to push this positive trend. Facing our troubling climate-related situations realistically is needed, but should not be an excuse to let it happen. Good article on Malawi’s crop subsidy program. An interview with a blogger provides a good look at citizen journalism and academic freedom in Malawi.